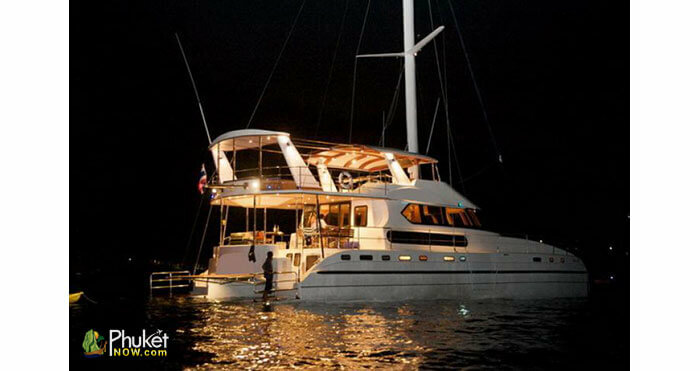 This 70 ft (21,3 m) luxurious charter catamaran, built in 2008 is now available for day and overnight charter in Thailand. 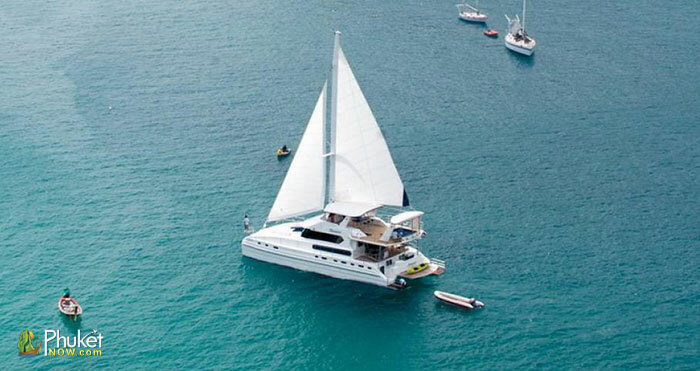 Spend a day or a week with your friends and family in absolute luxury on this beautiful sailing catamaran “Shangani” and explore the most beautiful sailing grounds in Thailand. 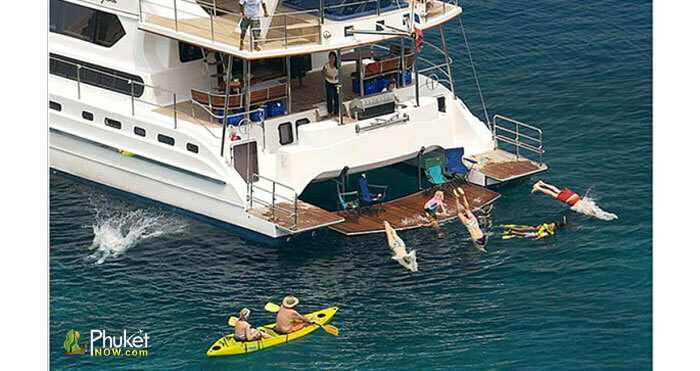 A crew of 3 to 5 people will look for you and make your charter memorable. 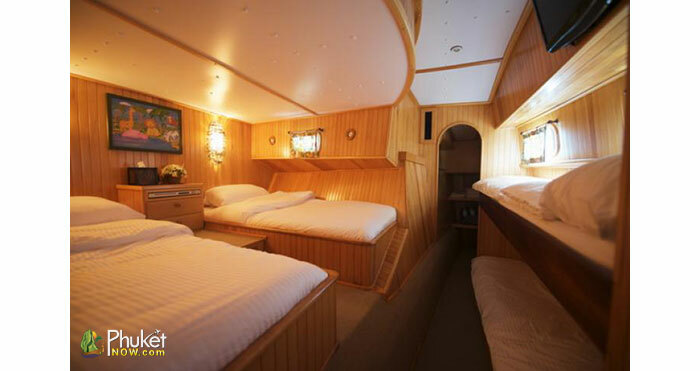 This luxury catamaran can accommodate up to 16 guests in 6 comfortable, air-conditioned cabins. 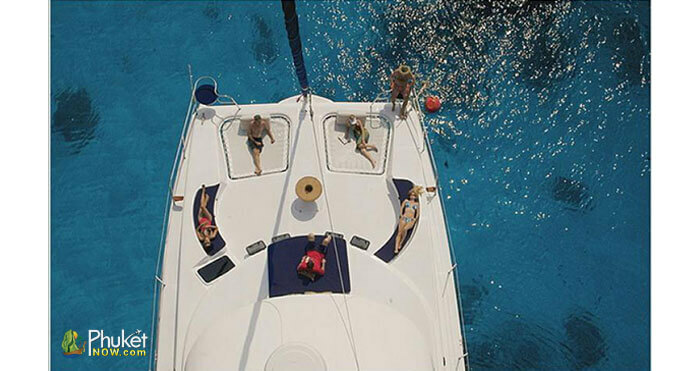 With exceptionally large saloon on the mid-deck and shaded quarter deck you will find a lot of place on this yacht to relax. The panoramic view and comfortable sofas in the large saloon let you fill like in a 5 star hotel with sea view. To enjoy your meals there are large dining table and outside seating with tables available. 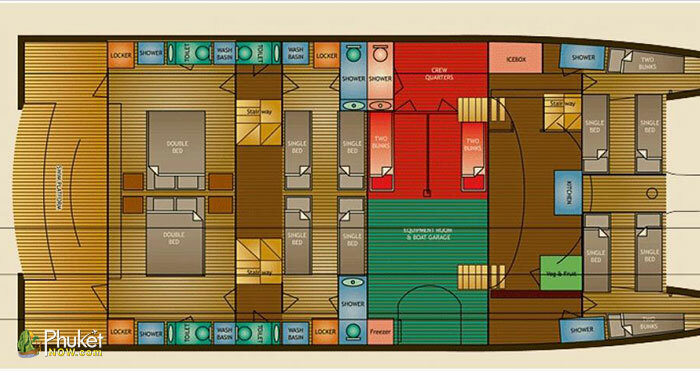 The large foredeck and upper deck with jacuzzi and the bar are further places with wonderful views. 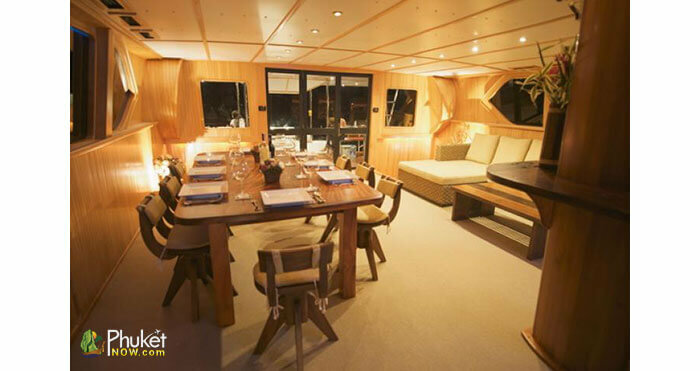 The menu aboard this sailing catamaran depends on your charter. 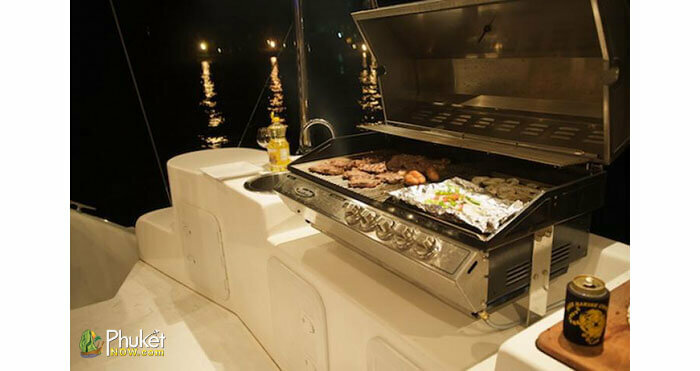 For a day charter you have the choice between barbecue menu with seafood and meat, accompanied by garlic bread and fresh salad, or a delicious Thai menu with different Thai dishes. For overnight charter you can choose delicious Thai food, western style cuisine, or why not freshly caught fish cooked on the barbecue with fresh local salads and fruits. All meals are in price included. Please let us know in advance before your journey begins about any special requests you have, or any particular preferences. For families with children we offer something special, just let us know how many children are travelling with you. 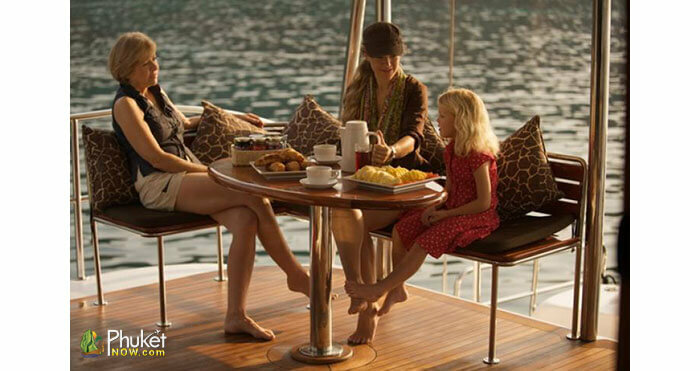 Your cook aboard will do his best to cater for all nationalities, as well as personal taste and dietary requirements. With the kayaks, available on board you can explore the hongs, deserted beaches and islands around Phuket. 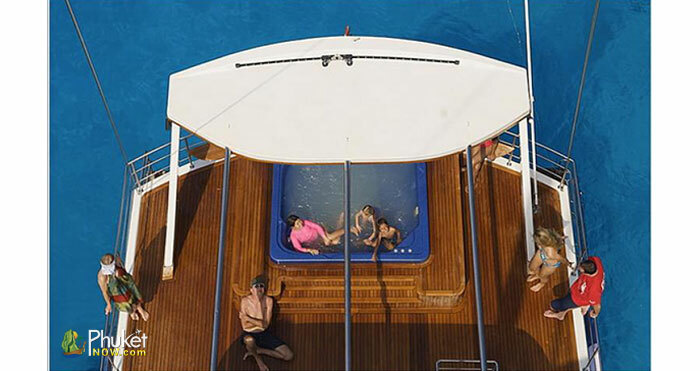 While you are sailing is jacuzzi for the kinds to have fun and for adults to relax. For overnight charter is a great masseuse on board with no extra charge, who give you world famous Thai massage if you desire. With 4 sets of quality dive gear on board and a dive compressor you can go diving at the best diving spots in Thailand. The captain of this charter catamaran will help you to have a safe diving. Please regard, for diving you will need a valid diving license. The price per day varies depending on the season and charter duration. Please send us your request via contact us page (enquiry form) and we will provide you with the total price for your chosen dates. November to March: 165,000 Baht / day* April to October: 150,000 Baht / day* From 9.00 am to 6.00 pm (very flexible), you may wish for 11.00 am to 8.00 pm. * These prices are for up to 20 people. 21-30 people add 1500 Baht per head Over 30 people see the Large group charter rates.